Hey all... it feels like forever since my last post, probably cause it has been a while... no worries, you're going to get post overload here soon! So my son turned 9 yesterday. Last year he asked for a Star Wars themed Party (it has actually been one of my most popular posts.) This year he asked if he could have a Ninjago themed party, "Of course" I said... but, in my mind I was kinda panicking, all I know is that they are little LEGO ninjas that my vacuum loves to find! 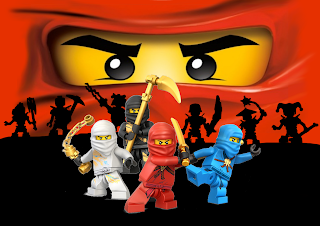 Well, no worries I thought, I'll just go to the Party place and buy the Ninjago party package... I couldn't believe they don't have such a thing (at least here in this city!) I have seen so much on line I didn't think this would be a problem. Well it's a good thing I'm crafty, lol! So I thought I would start by sharing how I made my sons Birthday Invitations. 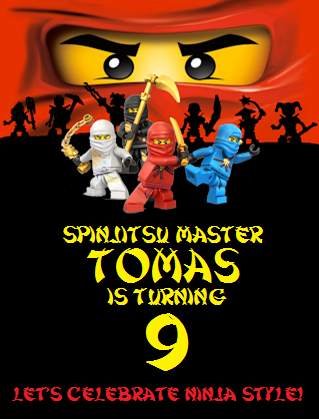 I found this image just by doing a Ninjago search on Google images. Click here for the exact site. I have Photoshop, but haven't really tried using it yet... so I stuck with things I already was familiar with. I opened up Paint on the computer and pasted it on to the work surface. Since I needed a bigger surface to write on, I sized the picture to the length I wanted. Then I clicked on the paint button and coloured the bottom portion black. All that is left to do is add your text. The font I used is called Shanghai. Once you are finished save your image. Open it up in whatever program you like and print it. I then used Word to create the rest of my invite. I really wanted something quick and easy to make especially for the his little school friends. So I thought I would just print it all out on one sheet of paper. To do that I divided my page into 4 sections. On the bottom 2 sections of the page I included a map and party details (see picture below). The top right section of the page I placed the image I created above, only flipped upside down. Fold the page in half and then in half again. Now they are ready to stuff in an envelope! So easy right? This is at least what I have planned... we shall see much I can actually get done! They look great Ilda! Can't wait to see your additional projects. Wonderful work can't wait to see what else you made.